My city has spent the last four years working on a project: to be the host city for the 2016 Olympics. The banners and signs are everywhere, draped or painted on everything imaginable. City buses and trains carry the logo. Even our famous Picasso sculpture in Daley Plaza downtown got in on the act, with a gigantic inflatable Olympic medal draped around his (or her) neck(?). CHICAGO 2016. Everywhere you look. I suspect that the signs are going to start coming down very soon. We were the first of the four finalist cities eliminated in the voting on Friday. Ouch. It hurts to fail. 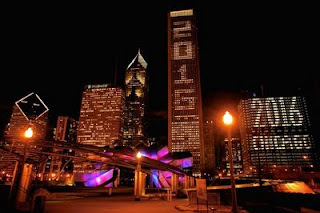 It especially hurts to fail publicly and spectacularly: “Thanks, Chicago. We aren't sure who we want to host the Olympics yet, but we know for a fact that we don't want you.” And it's not like we didn't try. We spent something like $50 million. We had the President and First Lady there shaking hands and lobbying for us. And Oprah, for goodness' sake. If the Obamas and Oprah couldn't do it for us, wow – the International Olympic Committee really didn't like us. Maybe I'm a little bitter, but Rio instead of Chicago? In the summer? So the “CHICAGO 2016” signs will come down, or be painted over. For a while, the media will be buzzing about the reasons we were rejected. Mayor Daley may take a little heat. Pretty soon, though, the postmortem will end and everyone will move on to other things. In a few years, no one will talk about it much anymore. That's the way it is with failure. It stings at first, but eventually the pain goes away and everyone goes on to think about something else. Except when it doesn't, and when they don't. I'm thinking about people now, not cities. People who can't easily obscure or erase the signs of their failure. Some of them wear those signs, literally, as numbers on the back of a prison uniform. Some hold them at intersections, here in a city that just spent $50 million trying to impress the IOC: Will Work for Food. Some are reminded of their failures by the high school diploma they didn't manage to get, or the sign on the office door that they always wanted but never really had a chance at. Then there are those for whom the signs of failure are less literal, but no less real: the man who sees his kids a few times a year because his marriage disintegrated, the woman who's losing her fight with pills or a bottle, the former church leader whose moral failings have him wondering what to do on Sunday mornings. Not to even mention the many smaller failures that everyone has to live with and sometimes bear the consequences of for a lifetime: relational failures, ethical failures, mistakes made in youth that can mark the rest of a life. The signs of those failures sometimes don't disappear. They can't be taken down or painted over. They're not easily forgotten with the passing of time. Peter had a failure like that. We still remember it, in fact. Still talk about it. Out of four Gospels that tell the story of Jesus, well, four mention Peter's failure. If you know anything at all about Peter, you probably know that he denied being associated with Jesus on the night of his arrest. We might consider that a little cruel, except that Jesus clearly isn't being cruel. He knows what Peter's up against. It isn't just the threat of prison or a cross. It isn't the power of Rome. Jesus understands that Peter's fighting a spiritual battle, and that no human being wins every one of those. He knows that Peter's denial doesn't come from a lack of courage, or a lack of love for him. It comes from Peter's spiritual weakness and the deception of the devil. It's also obvious that Jesus is on Peter's side. “I've prayed for you...that your faith may not fail.” Knowing that Peter was about to go through an ordeal that mirrored his own, Jesus had already prayed for him. Jesus wasn't going to stand by and watch clinically to see if one of his people was going to survive the battle. He intervened, interceded. He joined the battle on the side of his disciple, even though he knew that the disciple might lose a skirmish. That's why we don't know Peter only for his failures. Jesus wouldn't have it. Same with you. I know how failures can seem devastating and all-consuming. And if it was completely up to us, they would be irredeemable. But we follow the same Lord as Peter, and he still knows what his disciples are up against. He knows it first-hand, because he fought the same battles we do. He's still on our side, praying for us that our faith may not fail – even when our resolve, courage, and best intentions do. And he still believes in us and the service we can offer – despite and even because of our failures. He won't have you defined by the failures in your life. Even the spectacular ones. He offers us forgiveness, renewal, and redemption. And maybe you're especially in need of that today because you're especially feeling your failures. Yours are no worse than Peter's were, and they don't have to sink you any more than his did. Your Lord still loves you, still prays and fights for you, and still has a place for you that no one else can fill. Receive the forgiveness and redemption he offers, then find someone else who needs it and offer it in his name. By the way, I can probably set you up with some CHICAGO 2016 t-shirts. Cheap.